I have had this manger scene for as long as I can remember. I have set it out every Christmas and I have always looked forward to doing so. This year, I thought that maybe the kids would want to help out. I have always been very peculiar about how the the animals and people were placed in the manger. Therefore, I really had to convince myself that it didn't matter if Mary and Joseph weren't standing immediately behind Baby Jesus and that it was ok if the angel wasn't hanging from the back right hand corner. It had crossed my mind that maybe nap time would be the best time to arrange the nativity scene. However, Caroline didn't think she needed a nap today so there went that idea. Once Tucker woke up, I asked them if they wanted to help. I thought that they could take turns placing the figures in the manger and I would totally let them do it and resist the urge to rearrange while they weren't looking. Well, Tucker was more interested in making the sounds that the cows and sheep make. While most people probably have Christmas music playing in the background, we had Tucker's sound effects..."moooooo, baaaaaa." He quickly lost interest and went on to play with his bus. Caroline sat there quietly for quite a while. 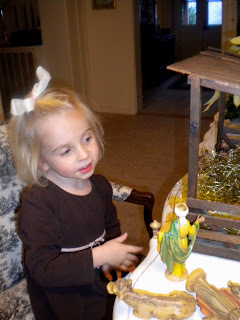 I assumed she was arranging the manger scene her way, and I was looking forward to see how she thought things should go. I took some pictures and then went to the kitchen. I heard her say, "Mom! I can't find Baby Jesus!" He was there...most likely buried under the hay. A few minutes later, Chad walked past her and I heard him say "Caroline, they don't go on the roof of the manger." Wonderful, I thought. This child really knows how to think outside the box (literally). I went over to her to help get her back on track. I suggested that maybe Jesus' mommy and daddy could be placed beside Jesus. That is when she informed me that Joseph was not his daddy (to which Chad said that technically she was correct) and that one of the Wise Men was Jesus' father. This didn't go exactly how I had expected...we'll try again next year!